This March, New Jersey based band, Sixty Miles Down will release their latest effort, an EP entitled, “A New Skin”. The album’s moniker is the same as the title track, but it’s also quite an apt name, for a few reasons. It’s been almost four years since Sixty Miles Down released their debut album, “Sink or Swim.” A lot has happened in that span of time, not the least of which is an almost complete transformation of the line-up. In fact, the only original member that remains is singer/founder John Mosco. Replacing the other four members of the band are Roger Manzo(guitar), Jeff mayer (guitar), Chris Delli Santi(drums), and Goob(bass). And a talented group they are. Upon listening to the new material, it becomes obvious that Mosco went to great lengths to make sure that he found the right pieces to complete this puzzle. Then there’s the music itself. While “Sink or Swim” was a great debut that created a good amount of buzz for the band, “A New Skin” seems to bring Sixty Miles Down to the next level, without losing any of the positive qualities that were previously established. Mosco still has one of the best and most unique voices that you’ll hear in today’s modern rock. He uses his talent wisely, with catchy melodies and hooks that can get stuck in your head for days. His lyrics are also a breath of fresh air from some of the fluff that seems to be plaguing many major radio stations. But the big question for fans of their debut release would have to be, how does the new band hold up? Not to worry, the chemistry between this group is flawless. It’s hard to imagine that these guys weren’t all playing together a few years ago, when the group was formed. On a technical level, one would be hard-pressed to find any weaknesses in their musicianship. What they bring with their new material is a bit more of a gritty, hard-edged sound that still maintains the technical prowess that fans of “Sink or Swim” have become accustomed to. The result is tracks like “Virus” and “A New Skin,” that are heavy, but at the same time very catchy and inventive. These guys don’t sacrifice creativity in order to achieve the deep and powerful sound that they’ve developed. And I choose that word “developed” intentionally, because this release marks a new plateau in Sixty Miles Down’s sound. They’ve always been difficult to compare to other bands, but it seems that with “A New Skin” they’ve really come a long way in breaking away from the crowd and creating their own musical identity. New Jersey metal clan Sixty Miles Down are big on dark, heavy hooks a la Alice in Chains, Il Nino, and 40 Below Summer. On the quintet’s 12-track disc, it’s hard not to stumble upon thick, rollicking guitars like the ones found on “Dead Weight”, “Resolution”, and “Broken Down”, but there’s a lot more to SINK OR SWIM than one mood. In fact, the ominous piano performance on “Raise the Dead” gives the track an eerie glow, while the contagious melody of “What You Never Had” sounds as if the band could be featured on mainstream radio. Overall versatile, (but at its best when the tone is considerably bleak), Sixty Miles Down combine the wares of Down, COC, Staind, and Godsmack with all of the melodic crunch you crave. Nah, you're metal fans so you get the point (and in all likelihood share it as well). What does my rant have to do with Sixty Miles Down's debut album Sink Or Swim? Well, Sixty Miles Down is what most would consider a "modern rock" band that has a sound I could see as radio-friendly, but they're also a band in possession of musical talent and songwriting ability that sets them far apart from the sonic goobers mentioned above. Plenty of bottom-tuned guitars and distortion, tons of bass groove, and a vocalist who sounds like a less depressed Layne Staley - that's Sixty Miles Down in a musical nutshell. What separates them is the variation of their songwriting as they ease from crushing riffs to power ballads to semi-industrial grooves. Frontman and band founder John Mosco captures the bleakness that hallmarked Alice In Chains and refines it with excellent range and sincere emotion. 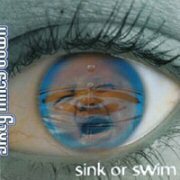 Sink Or Swim was recorded at a time when their drummer was splitting duties with another band and unable to participate in the recording process, so besides being the voice of Sixty Miles Down John also sat behind the kit. A far majority of the songs on the 12-track debut are strong enough to stand on their own, with some slight nuance or distinction keeping the album from falling into a rut. Of the many standout tracks, the first to catch my attention was the semi-ballad "What You Never Had". This song has the most potential to be a radio hit because of its Semisonic-like accessibility. Far from the heaviest on the album (aside from a couple of crunchy riffs), it still serves as an indication of the bands ability to switch gears and compose quality songs at more than one level. Getting back to what we're most interested in (that being the heaviness of Sink Or Swim), "Say Goodbye" is very reminiscent of early Filter for its electronic/industrial makeup. The title track, as well as "Resolution" and "Temper Takes Control", shows a clear Godsmack influence in both vocal styles and heavy riffs. "Raise The Dead" is the first of two ballads on the album (the other being "Waiting For You" with its expressive guitar opener). Again, a powerful performance from Mosco and some fine guitar lines keeps the listener involved and away from the "skip" button. Wrapping up the album is "Darkness Falls", with dual-guitar harmonies and some of the heaviest riffs on the disc. A short interlude with female backing vocals is a nice touch as well. Several members of Sixty Miles Down were splitting time in another New Jersey band called Anger of the Lamb, resulting in tensions which ultimately forced John to disband the group shortly after releasing Sink Or Swim. Striving to keep alive the band he founded, John recruited a new guitarist (Dave Chisholm) and a new bass player (Eric Bergmann) in early 2003 and set to work writing material for a follow-up to the debut. Should the rebuilt Sixty Miles Down be able to match or exceed the quality of Sink Or Swim, big things are sure to be on the horizon for these guys. Receive a FREE song just for signing up! © 2019 Sixty Miles Down. All Rights Reserved. Powered by HostBaby.